With the new fiscal year that began this month the Nuu-chah-nulth Tribal Council directors have approved a $51-million budget for programs, services and financial transfers to its 14 member nations. The fiscal plan was approved by NTC directors at a March 26 budget meeting, covering a range of services for over 10,000 Nuu-chah-nulth members on the west side of Vancouver Island and elsewhere. The current budget shows an overall increase of nearly $2.2 million in revenue over the previous fiscal year, representing 4.5 per cent more funding from various sources. The NTC’s main funders include the Department of Indigenous Services Canada, the First Nations Health Authority, Fisheries and Oceans Canada, Employment and Social Development Canada as well as B.C.’s Ministry of Children and Family Development. Beginning on April 1, the 2018-2019 budget includes a 1.75 per cent increase in block funding from Indigenous Services Canada over the last fiscal year. During the March 19 meeting, NTC President Judith Sayers noted the difficulties such an increase poses, which is comparable to the rate of inflation. Over 2017 the tribal council’s number of registered Nuu-chah-nulth members increased by 119 to 10,049. “It’s really hard to be operating on percentage increases when your populations are increasing,” said Sayers. Hesquiaht Chief Councillor Richard Lucas recalled when 60 per cent of the NTC’s previous $1.24 million in administration funding was cut in 2014. This measure was announced by the Conservative federal government, affecting tribal councils across Canada as well as national and provincial Aboriginal organizations. Lucas suggested that the NTC nations send a letter to Ottawa outlining their funding concerns. While 2018 begins a five-year block-funding agreement with the federal government, cash flow information from the Department of Indigenous Services only covers year one. Nuchatlaht Band Manager Mason Ducharme said a 10-year agreement with some certainty of what funding will be available each year would be better for the First Nation’s operations. 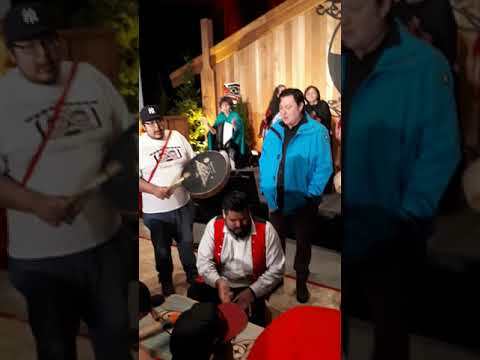 But Robert Dennis, Chief Councillor of the Huu-ay-aht First Nations, believes that requesting more funding from governments may not be the most effective strategy. Dennis stressed the importance of first Nations taking a role in natural resource developments. The Huu-ay-aht have an existing arrangement with Western Forest Products concerning harvesting around Barkley Sound and are moving ahead with a proposed natural gas export facility at Sarita Bay in partnership with Steelhead LNG. The NTC encompasses the Ahousaht, Ditidaht, Ehattesaht, Hesquiaht, Hupacasath, Huu-ay-aht, Ka:'yu:'k't'h'/Che:k'tles7et'h', Mowachaht/ Muchalaht, Nuchatleht, Tla-o-qui-aht, Toquaht, Tseshaht, Uchucklesaht, and Yuułuʔiłʔath First Nations.